Kudos to Verizon for the funny play on it's previous marketing sthick. 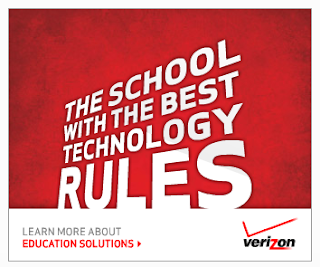 The company is running an ad which merely says "The School With the Best Technology Rules", linked to this page. Is there truth to the phrase? Depends on how you define "best". A lengthy piece in the NYTimes is making the rounds, saying NYET. Tom VanderArk takes this on, and refers us to other noteworthy responders in Richtel's Rear View Mirror Missed the Mark. The fact is, we're not there yet. In a few lucky schools, yes. But can the average district walk in and be sure they're wisely investing in a path to increased core learning? No. Walk down the street and ask people, "If I want to do social networking, share online with my friends, where do I go?" and you'll quickly be led to Facebook, Twitter, maybe YouTube. But walk down the street and ask "Where I should turn for K-12 learning?" and you'll get no answer at all.